In case you don't find an answer to your question contact us! What can I do with dawawas? Hi, we are Patrick and Fabian. Maybe you've heard about us: Back in 2006 we founded wer-kennt-wen.de. We were pretty annoyed that it is so damn hard to exchange private pictures with family and friends. That's why we created dawawas. Now you can share private photos with your family and friends more easily. You can find more information on our"Wer macht's"-Seite. What's on the main page?  The main page shows you what's happening on dawawas, whether it is the last activity in your event or friends' events. You will get notified about new photo uploads, comments or new likes. What's happening in "My events"? "My events" shows you all the events you created and events that you participated in. "Following" shows you all events you follow listed in chronological order. Those are events you didn't pesonally attend but want to keep updated. What does the search bar do? The search bar in the upper right corner allows you to search for events and people. Simply start typing in the search bar to start searching. Im Bearbeitungsmodus kannst Du die Fotos in Deinem Erlebnis bearbeiten. Dabei hast Du die Möglichkeit Aktionen auf mehrere Fotos gleichzeitig anzuwenden. Du kannst z.B. die Sortierung Deiner Bilder manuell ändern, so dass sie nicht mehr nach dem Aufnahmedatum geordnet sind. Du kannst mehrere Fotos aus einem Erlebnis gleichzeitig löschen, Du kannst aber auch mehrere Fotos aus einem Erlebnis runterladen oder in eines Deiner anderen Erlebnisse verschieben. How can I change my dawawas wallpaper? You can choose between five different wallpapers for dawawas. Click on the dropdown menu in the upper right corner and select your favorite wallpaper under "Design". How frequently do you send me newsletters or notifications? We hate spam as much as you do! That's why we will only notify you when something important happens on dawawas, such as new photos in one of your events or when we want to inform you about new features. How does dawawas make money? Like many other start-ups, dawawas ist currently financed by the founders. dawawas does not use advertisement to earn money but we are planning to offer print services and premium features in the future. There is no need to worry about the premium features: Our basic features (including everything we offer to you right now) will always remain free. dawawas will not sell your photos. How can I register for dawawas? Enter your name and your e-mail address on the homepage. You will then receive a link via e-mail. Just click on the link, to confirm your registration. Now is your dawawas account waiting for you! Which personal information is required for the registering an account on dawawas? For registering your account on dawawas all you need is a valid Email address and your first name. To ensure your friends find you on dawawas you can also add your last name. Your personal information is only used to create a personalized user account for you and to help your friends to find you. How can I invite friends from other social networks to join dawawas? You can invite people who are not currently memebers of the dawawas community to join via Email, link or Facebook. You can also send the invitation link via chat, such as Skype, MSN, or ICQ. Is it possible to use dawawas without Facebook Connect? Yes, we use Facebook Connect to make the login process easier on your part and to invite people to events using Facebook. But in case you don't want to connect your profile to Facebook, it still works perfectly fine. We are sad to see you go :( But sometimes even the best relationships don't work out. In order to permanently delete your account all you have to do is to send us an Email using the contact form on dawawas. How do I find the settings? Go to the dropdown menu in the upper right corner and select "Settings". Go to "Setings" in order to change all personal data, such as first or last name, Email address and username. Go to "Settings" and scroll down to the bottom of the page. Now enter your old and new password and hit "Change password". Help! I forgot my password! What can I do now? Don't worry. That happens to us as well from time to time. Click on the login menu and select "Forgot your password?". Then enter your Email address associated with your account and your new password. Afterwards we will send you an Email with a confirmation link, that you'll have to click in order to validate the password change . What's the best browser for using dawawas? We try to make dawawas compatible with all browsers. However, the usability is usually best on the latest browsers. Events are photo albums to share your private life events with your friends. Invite your friends to an event they attended so they can contribute their photos to the album. This way your events become complete photo collections, which let you relive it from different perspectives. Between which privacy settings can I choose for my event? Allows everyone who has the invitation link to the event to see the photos. This is the default setting for new events. Your photos are only visible for people who were invited by you. By using this setting, you make your event visible for everyone who shares at least one other event with you. If you choose this setting, your event will be visible to everyone in the web and may be found by search engines. How can I change the order of photos within an event? Photos are always sorted by the date they were taken. Unfortunately, the information about the date and time are not always correct. You can correct the date of the photos by clicking on the circled "i" within a photo. Now you can see when the photos was taken and change it by clicking on the date. Go to "My events" and click "Create event and upload photos"
How can I add photos to an existing event? Go to "My events" and select the event you want to add photos to. Click on "Upload photos" on the left menu bar and pick the photos you want to upload in the popup window. You can also upload multiple photos simultaneously by pushing and holding the Ctrl button while selecting multiple pictures. In case you want to add all photos in a folder to an event, press "Ctrl+A" in the folder view. Afterwards click on "Open" and all you photos are added to the event. How can I add people to an event? Can I delete people from an event? The event creator can remove anybody from an event. In case you are not the event creator you can only remove people that you added yourself. To remove people you have to visit the event main page and select "Invite friends". Now you can see a list of people with whom you've shared at least one event and who have participated in your selected event. Everyone who joined this event is marked with a little flag left of their profile picture. Simply click on "[remove from event]" and whoever you wanted to remove can no longer see your event photos. Can I share my events on other social networks? Absolutely, you can share public events on social networks. To share the event on Facebook click on the Facebook logo on the left-hand side in the event. Alternatively you can simply share the link to an event on any social network. Can I download whole events? Yes, you can download events you have attended as zip file. First click on "More" in the left menu bar and select "Download event" afterwards. How can I change the event cover picture? Just select a certain event and click on the picture you would like to set as event cover picture. Now pick the "Make event cover picture" option in the bottom part of the photo. How can I rename an event? Go to the event view and click on the event name, which immediately alters into a text box where you can change the event name. All links referring to the old event will stay active. Can I tag multiple locations in one event? No, currently you can only tag one location per event. Open the event you want to delete and select "More" on the left-hand side. Now click on "Delete event" to remove the event permanently from dawawas. Once you deleted an event it cannot be recovered. Welche weiteren Einstellungsmöglichkeiten habe ich als Erlebnisgründer? Wenn Du ein Erlebnis erstellst, wird zu Beginn nach der Sichtbarkeitseinstellung (Standard "Sichtbar für Eingeladene oder Link") gefragt. Nachdem Du diese bestätigt hast, kannst Du Fotos in das Erlebnis hochladen und Leute einladen. Wer darf einzelne Fotos bei Facebook posten? Are there any limits concerning the upload of photos? Once you joined dawawas, you can upload up to 500 photos in your events. Photos you upload into events that were created by other people do not affect your upload counter. It is possible to earn more free space by using dawawas actively, for example by inviting people to dawawas. This is how it works. How can I get more space for uploading photos? You will get additional storage space for every referral and for creating your first event as well as for setting a profile picture for the first time. This is how it works. How do I add smileys to a comment? You can simply add a smiley to your comment by typing in the characters shown on the right side of the following list. Is it possible to share photos privately with friends who are not registered at dawawas? Yes, it is. In order to do so, you have to change the privacy settings of your event to “Visible to people invited or via link” and invite your friends by sending them the link to the event. Please note, that your event is now visible to everybody knowing the link, so consider who you give it. Name photo: You can add an individual title to each photo. Like: Give photos you like a "like". Comment: Comment your friend's photos. Event cover picture: Set a current photo as event cover picture. Snippet as profile picture: Choose snippet as profile picture. Rotate photo: Align your photo in the right position. Delete: Delete the current photo. HD: Switch to HD mode. More infos: All you need to know: when and where was the picture taken, who uploaded it and which camera was used. Send photo via Email: Get the photo as Email to your Email address. Share on Facebook: Share the photo on Facebook. Fullscreen: Enter the fullscreen mode. You can upload photos by creating a new event or adding photos to an already existing event. What file types and sizes are supported? Your photos should be either JPG or PNG files and shouldn't be larger than 12 MB . Go to the photo you want to download and click on "Download" in the bottom area of the photo. Wie kann ich mehrere Fotos auf einmal runterladen? Wenn Du den Bearbeitungsmodus in der Erlebnisübersicht öffnest, kannst Du die Fotos durch einen Klick markieren. Alle Fotos, die Du markiert hast, haben nun ein Häkchen. Klicke jetzt in der linken Spalte auf "Auswahl runterladen“ und schon kannst Du mehrere Fotos auf einmal runterladen. Generally stand-alone photos can be downloaded by anyone who can see them and is logged in. The founder of an event can disable the download in the settings of the event. Who can comment on my photos? Every user of dawawas with whom you share an event can comment on your photos in this event. Who can delete a photo? The event founder can delete any photos uploaded in the event he or she created. Photos can also be deleted by the one who uploaded it. Can I share photos on other social networks? Yes, you can easily share photos on Facebook and other social networks. Just pick the photo that you want to share and click on the Facebook icon. Alternatively you can simply share the link to a photo within a public event on every social network. How can I remove a photo from an event without deleting the whole event? Go straight to the photo in the event. When moving your cursor over the photo a toolbar will appear. Click on the trash can on the toolbar to delete the photo from the event. How can I change the filename of a photo? The filename of a photo is only visible to the uploader and cannot be changed on dawawas. You can, however, attribute a specific title to each photo. How can I directly access a photo? In case you know the exact number of a photo within an event, you can directly get there by clicking the number of the current photo. Now enter the number of the photo you intended to see and hit Enter. Wie finde ich die Informationen eines Fotos? Aufgenommen: Hier kannst Du das Aufnahmedatum und die Aufnahmezeit sehen. Hochgeladen: Hier kannst Du sehen, wer das Foto hochgeladen hat und an welchem Datum. Kamera: Hier kannst Du sehen, welche Kamera für die Aufnahme verwendet wurde. Als Erlebnisgründer wird Dir auch der Original-Name der Datei bzw. des Fotos angezeigt – den können Deine Freunde aber nicht sehen. Wie lösche ich mehrere Fotos auf einmal? Im Bearbeitungsmodus kannst Du mehrere Fotos gleichzeitig löschen. Dazu musst Du nur in die Erlebnisübersicht wechseln und den Bearbeitungsmodus aktivieren. Wähle die Fotos an, die Du löschen möchtest, so dass sie durch ein Häkchen markiert sind. Mit einem letzten Klick auf den Mülleimer in der linken Spalte, kannst Du alle markierten Fotos auf einmal löschen. Wie kann ich die Reihenfolge der Fotos im Erlebnis mit dem Bearbeitungsmodus verändern? Wenn Du den Bearbeitungsmodus geöffnet hast, kannst Du auf ein beliebiges Foto klicken und es somit markieren. Danach kannst Du das Bild in der Reihenfolge nach vorne oder hinten verschieben. Wie kann ich Fotos in ein anderes Erlebnis verschieben? Mit Hilfe des Bearbeitungsmodus kannst Du Bilder aus einem Deiner Erlebnisse in ein anderes Deiner Erlebnisse verschieben. Dafür musst Du die gewünschten Fotos im Bearbeitungsmodus einfach markieren und in der linken Spalte auf "Auswahl veschieben" klicken. Danach öffnet sich ein Fenster – dort kannst Du zwischen Deinen Erlebnissen aussuchen. Klicke auf das Erlebnis, in das Deine Fotos verschoben werden sollen und bestätige mit "OK". What's the difference between following and joining? Joining an event naturally means that you have attended the event, in this case the event will show up under "My events". Following an event does not mean that you were there, but that you are nevertheless interested in what's happening in there. How can I unfollow/leave an event? To unfollow or leave an event you have to navigate to the event's main page and click on your actual status. Now click on "unfollow" and you are no longer getting any updates from the event. Why do I need a profile page? Your profile page introduces your friends to your events. In addition there are connections to other social networks. To upload a profile picture, go to the dropdown menu on the upper right corner and select settings. Click "Upload a profile picture". Alternatively you can cut out a snippet from your event photos and use it as profile picture. How can I connect my profile with Facebook, Xing or wer-kennt-wen.com? And how can I remove the connection afterwards? Go to settings to add links to your social networks. Make sure to have your pop-up blocker turned off when connecting dawawas to Facebook because a Facebook Connect pop-up will appear where you have to login to Facebook. In order to remove a link to a social profile, you simply click on the small trash can next to the profile listings. Why should I connect my profile to Facebook, wer-kennt-wen or Xing? dawawas is only a photo-sharing platform and has no internal messaging system. When adding a link to your other social networks other dawawas user can find you and contact you. How can I change the visibility of an event? You can individually change the visibility for each event. The default setting is always "Visible for people invited or via link" so that only people you've invited can see the photos. What happens when I change the visibility of an event? When an event is public or visibile by link you can further restrict the visibility by changing the status to "Visible to everyone who was invited". Now the event is only visible for event participants and people who follow the event. When you decide to change the visibility back to "Visible for people invited or via link" we create a new link to disable the old links. Your profile visibility is depicted in the settings. You can decide, whether your profile is only visible to users logged in to dawawas (default) or public. When you change your profile settings to public, all your public events and links to social networks are shown. "I was there": Choose this option if you have participated in an event. "Visit and follow": You didn't participate? But you are still interested in the event? Then that's the right option for you. "Unfollow": Oh, you really want to leave the event? Here you can unfollow the event. Will my photos appear on Google? Only if your photos are set to public. Who can see my events? "Visible to everyone who was invited": Only people who participated in the event or follow the event can see the pictures. Non-members of dawawas don't have access to your photos. "Visible for people invited or via link": The same settings as for "Visible to everyone who was invited" apply. Also every non-member of dawawas can access the photos with the direct link. "Visible to everyone with shared events": Everyone within dawawas with whom you have a shared event can see your events. "Public": Be careful! Everyone can see your events and photos online. How can I upload many photos at once with the Android app? Open the Android gallery app and select “choose image”. Now you can select all images you want to upload. If done so, tap on the “share” symbol and choose dawawas – now you can decide in which event you want the photos to be uploaded.